When it comes to bathroom designs for a home the first thing to be considered is the personal hygiene of the family member. A good bathroom design is created by the clever use of the bathroom accessories including the placement of sinks, bathtubs, toilet, the use of lighting and colour to give it a decorative and stylish look. The use of light colour, shiny tiles with damp proof, good lighting gives a luxurious feel and leaves a hygienic impression on our mind. Bathrooms are getting smarter everyday in the world of stylish and sophisticated homes. The bathrooms designs ideas are creating a great design statement under various bathroom categories. 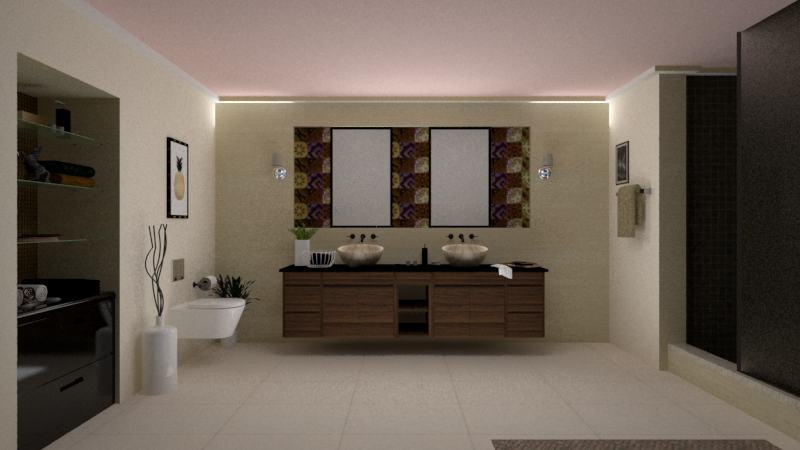 Whether it is master bathroom designs, modern bathroom designs, contemporary bathroom designs, luxury bathroom designs, small bathroom designs or shower bathroom designs each has created a unique impression in the world of decoration and styles. A master bathroom should be spacious well designed and easily accessible from the master bedroom. It is called the master bathroom as it is often built in within or adjacent to the master bedroom. The first thing to be considered while designing is that who is going to use the bathroom and how. Most probably master bathroom is going to be used by two people. So it is good to provide double sink with long countertop for two people to use the sink without any inconvenience at the same time. 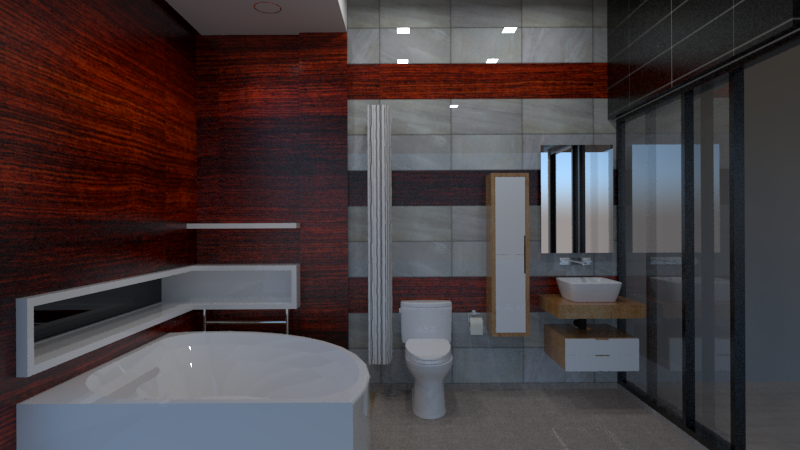 We have got a design of this bathroom. This bathroom design features a rectangular bathtub made of acrylic. This acrylic bathtub is lightweight and easy to install. A glass window is provided in the wall above the bathtub. The wall behind the bathtub is of stone brick texture. Next to this toilet accessories is installed. The wall opposite to the bathtub is provided with double sink on a long countertop for the two people to use at the same time. A large mirror is used on the wall and a wooden deck is provided below to keep the baths and grooming essentials. Modern Bathroom leaves a neat, clean and simplistic impression. 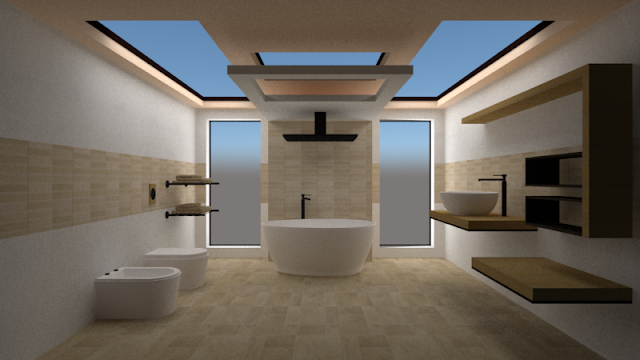 Modern Bathroom is suitable for almost all types of houses. A modern bathroom uses geometric shapes, light colour, a touch of greenery to give you a good relaxation and refreshing space with cleanliness and great comfort. Modern Bathroom design has gone a long way in the sophisticated styles of house. Take a look at this bathroom design it has an elevated bathtub of oval shape with steps. There is a separate shower cabin next to the bathtub for changing clothes or taking shower. The other side of the master bathroom has a toilet. A green plant is potted near the toilet to provide a freshness in the bathroom. A sink fitted in wooden cabinet is fixed in wall opposite to the bathtub. It has a large mirror above the sink. The wooden cabinet is provided for keeping the bathing and grooming essentials. 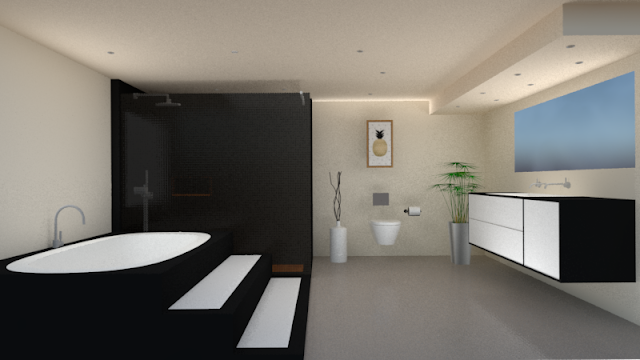 A contemporary bathroom is about the use of sleek, simple and elegant bathroom fixtures to give it a contemporary look. It may be similar to modern bathroom but its styles and looks differ from that. 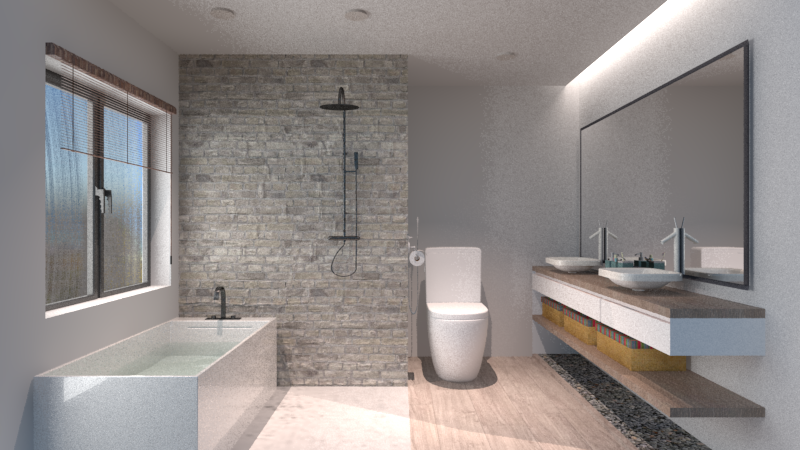 A contemporary bathroom can be well designed in a smaller space and can also be suitable for larger space. While designing contemporary bathroom carefully consider the material you will use. A sharp coning crystal clear bathtub to the glossy tiles will give it an enormous elegant look. Look at this contemporary bathroom. In this contemporary bathroom quarter bathtub conning sharply is used with crystal finishing. The wooden fitted wall around the bathtub is leaving an eye catching impression. The wall behind toilet has white shiny tiles with wooden fittings in between. A clean, white geometric vessel sink is used with a window above it. The other side is having the large reflecting glass wall. Matching to the glass black glossy tiles are used above it. The smooth shiny floor tiles are attention grabbing. Luxury Bathroom is getting popular day by day due to its great luxurious, lavish and stylish look to give you a sense of heaven inside your house. The world of house is changing it is becoming stylish so the bathroom to add a touch of style and luxury to your house. It is to be large for a bathroom to be luxurious. Take a look at this luxury bathroom design if you dream of having a luxury bathroom in your house. This bathroom is provided with remote controlled toilet with self cleansing function. Small metal decks are fitted in the wall for keeping towels next to the toilet. A oval shaped acrylic light weight and glossy finish is installed in the center of the back face. It has everything from a top shower to the tap for filling bathtub to give you a most luxurious relaxation time while bathing. The wall behind the bathtub with shiny small tiles matching the floor is adding a glamorous impression to the eye. The wall to the right of the bathtub is provided with wooden deck for keeping bathing accessories. A shiny crystal oval shaped wash basin with metal tap is placed over a wooden deck. A wooden deck is also provided for sitting, relaxing or keeping accessories. The large reflecting glass window is adding a sparkling and stunning look to the bathroom making you feel like having a bath under the shiny sun rays. Small Bathroom as the name suggest may be small in size but need not to be uninspiring. This small space if utilized in a proper and strategic way can give you every rejuvenation and refreshment a large or luxury bathroom is capable of. A small bathroom can look spacious, stylish and impressive with proper placement of bathroom fixtures and space-efficient ideas. 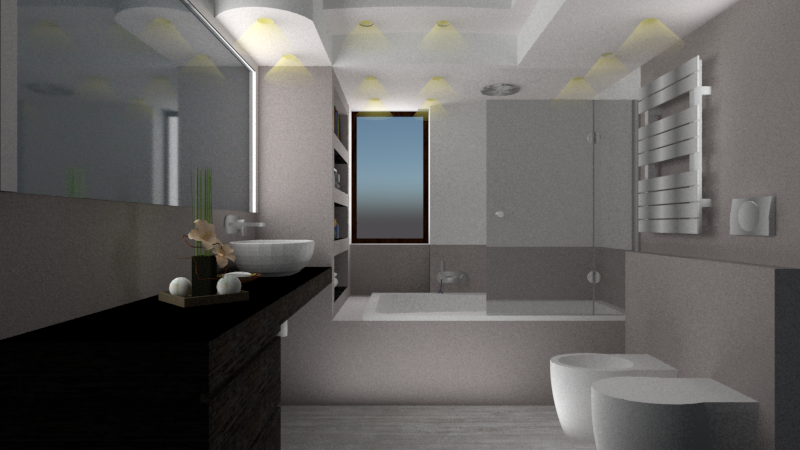 Here comes this amazing bathroom designed in small space but giving an impression of spacious and elegant bathroom. This bathroom has dark wooden cabinet for storing baths and grooming essentials. A touch of greenery is added in the form of small potted grass and flower above the wooden cabinet for refreshing environment. A circular crystal clear fiber sink is used. A large shiny glass mirror is provided above the wooden cabinets. The other half of the bathroom has acrylic bathtub installed and provided with a glass door. To save the space built in cupboard is provided in the wall besides bathtub for storage purpose. The other wall of the bathroom has toilet fixture. An elegant enormous ceiling is used with sharp curves and led lighting to give a grand appearance to the bathroom. Shower bathroom as the name suggests is provided with a shower cabin for a rejuvenating and refreshing bath. It is called so because it has a shower fixture with a toilet. The shower cabin is usually a closed one provided with a sliding or openable glass door. Look at this shower bathroom design. This shower bathroom has cabinet fitted in the built in cupboard provided in the wall for keeping bathing essentials and accessories. A touch of greenery is provided to the sides of toilet for a natural freshness in the bathroom. It has double sink placed over a wooden cabinet each having a separate mirror for the two people to use at the same time. The other side is having a shower cabin which has all accessories fitted in and provided with a sliding glass door. I love the modern and luxury bathroom but I'd add more colour and personality to mine. Master bathroom is always my choice. I have already upgraded my living room and kitchen I guess I should update bathroom too. We have just had both bathrooms redesigned and went for a modern feel. As a family of 6 we needed something stylish but practical! Those are really beautiful bathroom designs but I like the most the modern bathroom designs, for me, its looks more elegant. Those are great concept of bathrooms. I would love the Master bathroom so cozy and beautiful design. These are such an awesome bathroom designs but I like the the most the small bathroom, the interior is so perfect for me and small bathroom is so easy to clean. Oh wow, I just love all these designs! My favourite is the one with the steps, although I'd be a bit concerned about slipping after a bath! But it's so elegant. I would love any of those restrooms. They look so relaxing and spacious. Definitely a place I would like to get away to and relax. oh i love the list of different styles and designs of restrooms. it looks spacious and well designed.